Business process improvement? The problem as I see it is that, generally, there is no such thing as a business process. When you map a process, you have just that, a process map. It is a piece of paper or screen view of what happens in the business. It is a graphical representation of routine, of behaviour, of what people do on a daily basis to turn inputs into outputs. The issue here is – if processes don’t exist, how do you make them better? An easier question is – what does exist? The answer is ‘routines and habits’. People come to work and complete their daily tasks using the same routine, day after day. The routine (processing sequence) is almost ingrained in them. They do not need to refer to operating manuals or ask colleagues for help. They know what to do – and when to do it. This routine is their daily habit. (I do acknowledge that Business Process Management (BPM) solutions substantially automate processes and remove the reliance on habit and routine). A wise man (either Steve Rigby or David Lipschitz; they are both wise) once gave me the phrase: “Tell me how you are measured and I will show you how you behave”. This phrase is brilliant as it unlocks the difficulties associated with business process reengineering. If you redefine process from being “a sequence of tasks completed in a sequential manner” to “a sequence of habits completed in a routine manner”, then you have the answer. Change the habits to change the process. So, how do you change habit? You change the measures. Tell me how you are measured and I will show you how you behave. Change the measures = change the behaviours = change the habits = change the process. I am not so one eyed as to believe that measurement is the cure to all things process, but I am a firm believer in the idea that if you can’t measure it, you can’t manage it. So measurement is a good start for changing the process. Many of you will be thinking that your process measures (KPI’s) are reasonable and there is no need to change them. This is probably correct. The answer is to extend them, either on the same score sheet or in another sheet. Include measures of the specific points in the process where the process needs redefining (i.e. where bad habits occur). Often, these points are not process-related at all. Rather, they are decision points within the process – points in the process where the worker has to make a call on the best way forward, where they have to break routine. This can be for a multitude of reasons: not receiving all the information they need, the customer asking for something out of the ordinary, the computers are down, there is scheduled maintenance on a need piece of machinery, etc. Decisions cost money, increase headcount requirements, decrease the predictability of the process outcome and impact gross margins. To reengineer a process is to minimise decision making in the process. A process is never a single entity – rather it is a collection of paths. Each path is created by a decision. Consider a decision with a 60/40 split. Immediately you have two paths, each carrying a different volume. One has 60% of the volume, the other has 40%. Now imagine that the 40% path has a decision with a 70/30 split. Now there are three paths, with one carrying 30% of 40%. Not much volume at all. Every decision introduces another path. Paths 1, 2 and 3 all complete – they all end with a common output. Path 4 does not complete. Often, these paths will be modelled as rework or similar. In this example, we will assume it simply leads to scrap. Once the process is mapped with the decision splits in place, the next piece of data to consider is the work and cycle time associated with each step or collection of steps. For example, step 1 takes 30 minutes to complete; the hand-off between steps 2 and 5 has a built in 4 hour delay. So you plug in all this data. 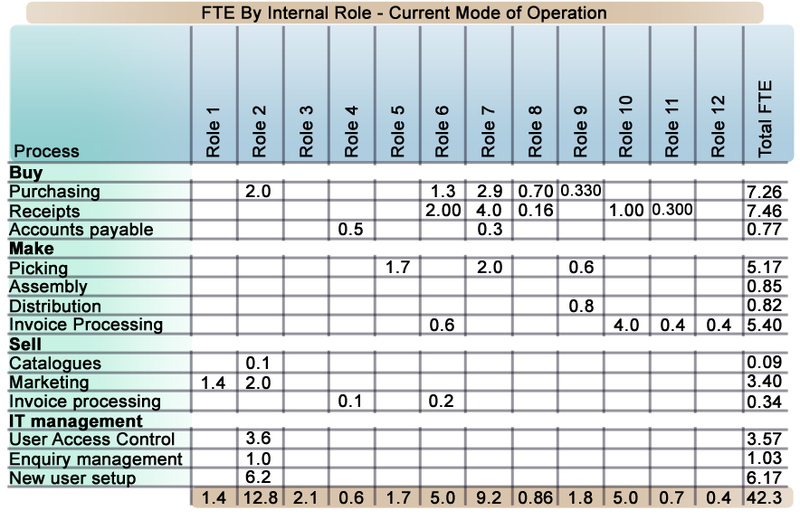 Then you need to attribute role costs to each step in the process. Now you multiply volume x effort x cost. This will give you a weighted average of each path in the process. 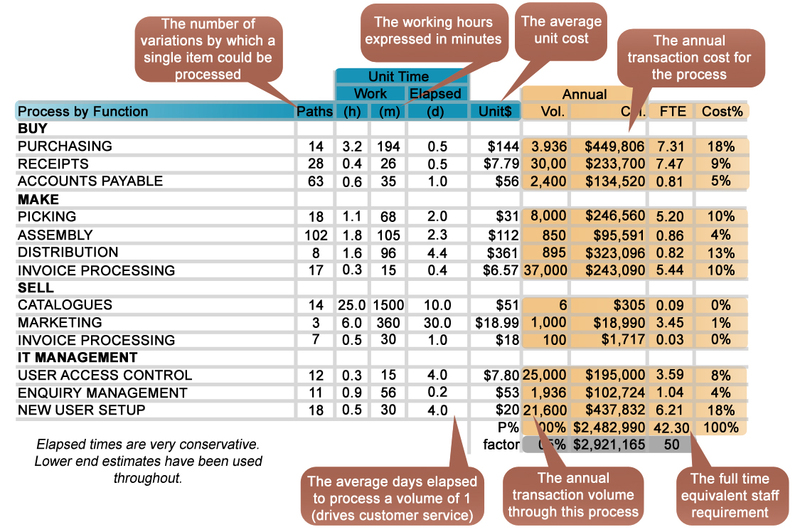 Path 1 has an activity based cost of $100 versus the weighted average cost for the process of $149. Path 1 also carries 60% of the volume. The challenge is now to maximise the opportunity represented by this decision. The ultimate goal is to remove it from the process. If that can be achieved, then the process becomes path 1 and the weighted average cost becomes $100. This represents a savings of $49 per process run. Assume a volume of 10000 and then this is a savings of $490,000. The savings by process can be aggregated by department or function. There is a corresponding impact on staffing. To get rid of the decision is to take the decision before the process starts. This can be achieved with process reengineering, policy or behavioural changes, or it can be forced with technologies such as Imaging or workflow. The following is an example of how a policy can be associated with a process and, by extension, the roles impacted by that policy. Performance is best described as plan v actual. What did I set out to achieve versus what did I achieve. This is quite a simple concept and I have never quite managed to get my head around why companies don’t do this well, especially as there is a huge industry selling business intelligence software that purports to do exactly this. My experience has shown that supervisors are not taught to supervise. Let me explain. The process of management is the same for all companies. Schematically, it looks like this. While the management process is common for all companies, the business process obviously differs by process and by company. Performance management links the two processes together. First, as described above, you need to calculate the weighted average effort required to complete 1 iteration of the process. For example, to complete an invoice payment takes me 25 minutes. You can calculate this figure or you can guess it. One is more accurate than the other, but the main thing is to have consensus on the number. Then (simplistically speaking) you multiple this number by the annual volume i.e. 10,000 invoices. Then divide the total by work hours and you have your Full Time Equivalent headcount. In this case it will take 1 person 555 days, working 7.5hrs a day to complete the work. Or more rationally it will take 2.5 full time staff to manage the volume. Now you have your staffing level. The next step is to allocate them to work. They should be working at the standard of 1 invoice every 25 minutes. This assumes a constant flow of invoices. In the management process, the step for allocating work is ‘schedule’. This is a vital step in effective management and is the primary responsibility of the supervisor or team leader as it is directly responsible for managing cost. Once the process has completed, it is measured. This should simply be a comparison of plan versus actual and the manager/supervisor will deal with the variance. Variances can be caused by poor process, low skills, laziness, pacing and a range of other issues. It is quite fascinating how many businesses miss this step. They have scorecards that measure ‘actuals’, but seldom do they compare these actual’s to the plan. You need to ask yourself: why bother measuring actual if you are not comparing them to what you set out to achieve? While it is important to measure specific transactions it is equally important to use ratios to cross reference transactional measures against each other to drive further insights. For example, the sales measure is going up – that is good. Costs are going up – that is not so good, but easily explained. But an analysis of the gross margin (GM) ratio may show that the GM percentage is declining sharply. That is terrible. It is only once you compare sales to costs do you get the true impact of the trends of the individual measures. While the above is reasonably obvious, it is quickly forgotten that you can’t fix a ratio. You can only fix the individual measures that make up the ratio – hence the need to manage the individual transactional lines. A key question is – how does the supervisor manage the individual measures in a way that any surprises are avoided and variances to plan are minimised? The answer is ‘Short Interval Control’. Consider a supervisor working the floor of a bottling plant. Bottles are whizzing around at a rate of hundreds or thousands a minute. Short interval control requires the supervisor to be checking his schedule every 15 minutes. If he waits an hour, the magnitude of scrap from a processing error would be enormous. Contrast this to a claims processing department. Each claim may take 90 minutes to complete. Short interval control may only require checks at 2 hourly intervals. The day starts at point A. This should manifest as a start of shift meeting. At this time, the supervisor or team leader reviews the day’s production targets (point ‘B’) with the team. They confirms staff attendance, set up/tear down requirements, processing sequence and – in the event where different lines are processing different product, then this work is allocated out. The start of shift meeting should be no longer than 10 or 15 minutes. Depending on the production environment, the most effective tool I have seen for managing SIC is a large whiteboard secured firmly to the wall. It has time interval columns pre-drawn on it with permanent ink. The supervisor then updates it with the days production as discussed at the start of shift. The white board will have 3 rows for each production line. 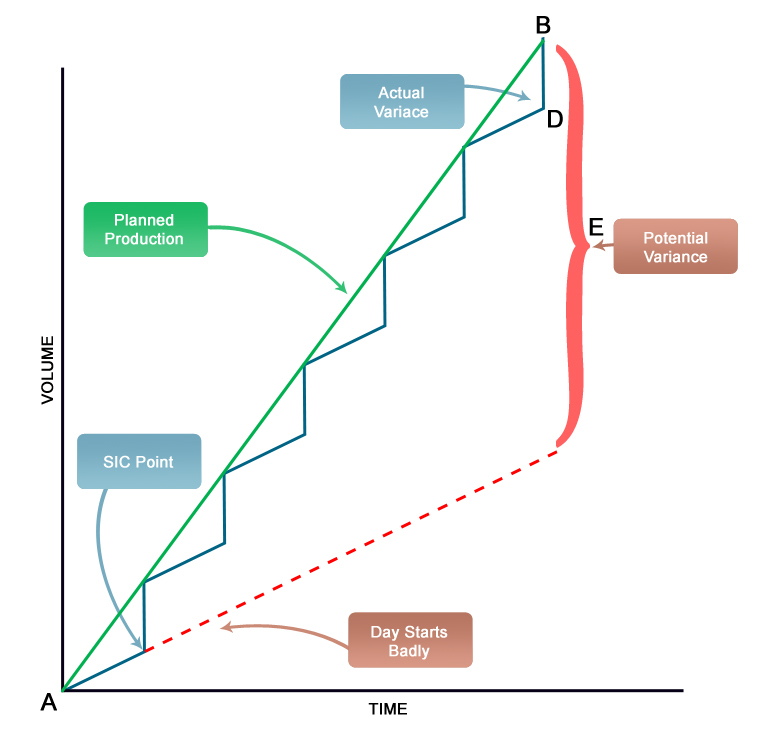 1 for plan, the second for actual, the third for variance. 1. Staff are working too fast. This may be good, but it may also mean that they are sacrificing quality for speed. Consider an operator on a line preparing chicken skewers. If they work to fast, they will not clean all the meat off the bone and the waste will be high. 2. Staff are working too slow. On the other side, there is the operator working too slowly. This may be because of operational issues. The operator’s station may be being fed raw product too slowly, it may be a skills issue or it may be attitudinal or a host of other problems. In both situations the Supervisor is required to take corrective action to bring the production output back onto plan. This is point ‘C’ in the graphic. Ignoring the problem will result in a substantial variance at the end of the day; point ‘E’ versus point ‘D’. The most important point in all of this is that if you want to substantially increase productivity, then adopting SIC in some form or other is mandatory. It is often critiqued as being Taylorism in disguise. In the wrong hands, this critique may be true, but with common-sense, it should never become a tool for driving punitive behaviour. SIC does not only apply to supervisors and team leaders. It is applicable for all operational managers in all departments. The difference between the COO and the floor supervisor is that the COO has a longer interval between control points. The all important question is how the COO should be advised of the daily production. The answer is HODO – the Hierarchy of Dependant Objectives (HODO). The HODO was a term given to me by my late father to describe operational communications between levels of management. 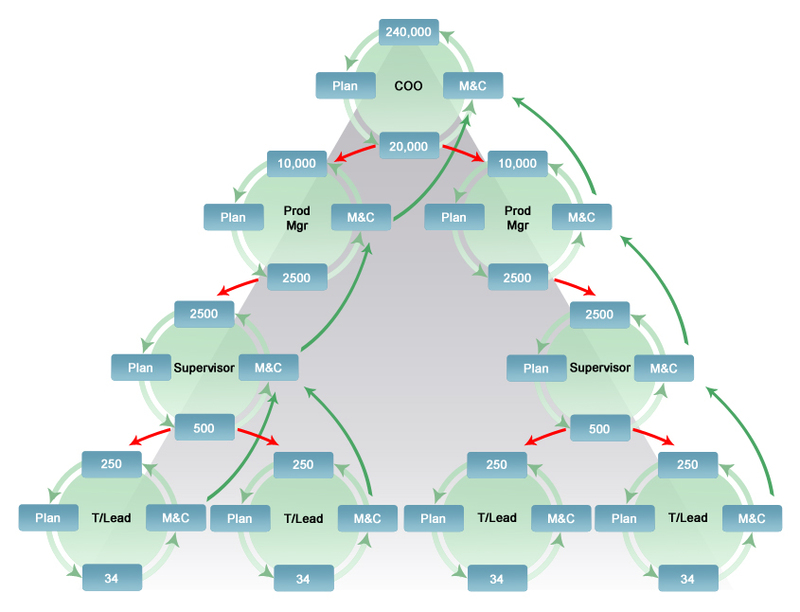 To increase the complexity slightly, consider that the business has two production plants. This means that each plant should produce 10,000 units per month. Now consider that the business sells 4 different product types. Each plant is responsible for two lines. This means that each plant should produce 5000 units of each line per month. The plants must produce 1,250 units per week or 250 units per day or 34 units per hour (7.5 hour shift). So, if the business produces 34 units per hour across 4 products, across 2 plants, then it will meet the operational requirements of the business. 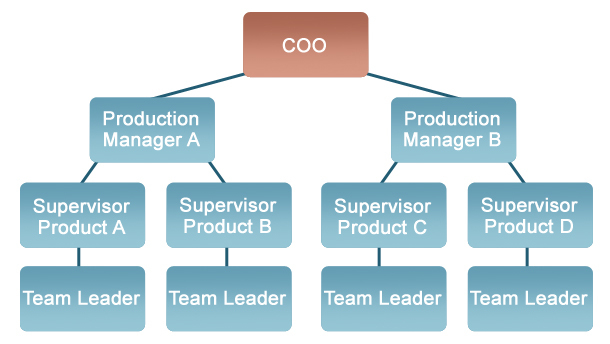 Let’s overlay this with a typical operations organisation structure: the Chief Operating Officer (COO), Production Managers, Supervisors, Team Leaders and the workforce. The workforce is not treated as management. The picture on the right is the traditional hierarchy. The picture on the left is the flow of information. The red line is the disaggregation of information down the hierarchy. Note that Schedule goes to Forecast. This is vital as you cannot have a lower level management working on an operational time line longer than that of the next level of senior management. The green line is the aggregation of information up the hierarchy. There are a number of key points here. Without a formal review of Plan/Actual/Variance it is almost impossible to say if you have had a good day.